The perfect New Zealand holiday to me is one that strikes the ideal balance. Nature and city. People and animals. Fast and slow. Bucket-list-worthy and cheap-n-cheerful. It’s authentically Kiwi and leaves you reminiscing about all the fun you had. The West Coast of New Zealand offers exactly that! In particular, we fell head over heels in love with the little seaside town of Hokitika. It’s arty, incredibly gorgeous and reminds me a little of what my home town used to feel like 30 years ago. Above all else though (and there’s plenty in Hokitika to be proud of), it has glow worms by the droves and a bunch of friendly eels ready for you to feed – all for free! We know travelling can be expensive and that having a couple of budget-friendly New Zealand travel tips up your sleeve can really help. 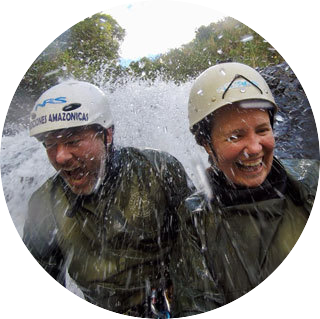 Make one of those activities an adventure just slightly out of town to feed the local freshwater eels – you’ll feel like a real Kiwi in no time! Driving into Hokitika (from the North): Take the first driveway on the right immediately before the Hokitika Holiday Park sign. Driving out of Hokitika (from the South): The the first driveway on the left immediately after the Hokitika Holiday Park sign. Once you’ve found the right gravel driveway, you’ll see signs pointing you in the right direction. There’s plenty of parking on site and the creek is not far from the road. Is it Actually OK to Feed Eels? Feeding eels is an old-school Kiwi kid pastime and according to the Department of Conversation, you’ve got the green light to do so. How lucky is the West Coast to have so many gorgeous spots that provide shelter to these extraordinary creatures (and how lucky are we to be able to pay them a visit)? Just be careful to keep your fingers well clear of them when feeding them – you can never be too safe. What Should I Feed the Them? Freshwater eels are carnivorous and, in the wild, eat ‘live’ food. Fortunately though, you don’t have to take live food along with you to feed your new friends. Instead, pop down to the supermarket and ask the deli counter to package up some luncheon sausage for you. This cheap sandwich meat is a favourite with the eels and won’t break the bank – $5 will get you a very generous bag (for which your new friends will be very appreciative). Though some people in New Zealand do eat eels, these ones are strictly for you to enjoy in their natural habitat. Enjoyed by locals and visitors alike, it’s important that these guys are left in peace after you’ve fed them. They’re relatively tame and beautiful in their own odd way, so let’s leave them there for everyone to enjoy. This entry was posted in Destinations, Hokitika, New Zealand, Oceania and tagged South Island, West Coast.